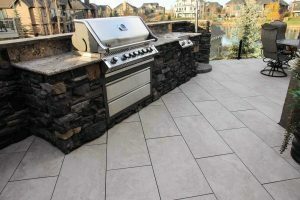 Outdoor kitchen in Calgary. Large tiles and custom granite counter-tops with BBQ - Curb Design Inc. Breath taking outdoor kitchen in Calgary. Large tiles and custom granite counter-tops with BBQ.